Omochi is popular food for new year's day in Japan. It also commonly used for Japanese Sweets. 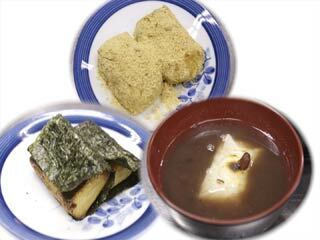 Oshiruko, Abekawa Mochi and Isobeyaki are most popular Omochi Dessert. Oshiruko is Omochi Soup with sweet Azuki beans. Abekawa Mochi is also known as Kinako Mochi is Kinako flavored Mochi. Kinako is a powdered soy beans. Isobeyaki is sweet soy sauce flavored Omochi lapped with Nori. First Kinako Mochi with powdered soy beans. Next Oshiruko with azuki beans. And, Isobeyaki with Nori and sugar soy sauce. First cut Nori for one -roll-size of Omochi like this. Next, let's make Kinako. Add sugar into Kinako. If you like sweet taste, add many sugar. Add little salt and mix them. Next, put water into a pan and put Azuki into water. The amount of water is the same as Azuki. Then boil them. Stop boiling when its get boiled. Let's cook Mochi. This time we use a pan to cook. When a pan is heated, put Mochi. Use weak heat when you cook Mochi. Let's make Oshiruko first. Add boiled Azuki into a bowl. Then add Mochi in. That's it. Next Kinako Mochi. Put mochi into hot water and then remove them into Kinako. Add Kinako all over Mochi. That's it. First let's make Soy Sauce for Mochi. Add Two large table spoons of Soy Sauce. Then add one large table spoon of sugar. The same, let's cook Mochi. Once Mochi is getting bigger dip them into the sauce and cook it again. Then, roll them up with Nori. That's it. In Japan we eat many Mochi at January, especially new year's day. Try those Mochi Sweets, too.